The coast within the Park borders between Rowy and Łeba, is one of the few fragments of the Polish shore where until the recent time, accumulation predominated abrasion. The sand being thrown to the shore by the waves settles on the beach. Further material translocation to the Łebska Spit is taking place due to the wind activity and has a jump course. Alternately, there occurs wind blasting (deflation), transport, deposition (accumulation), wind-blasting. The wind activity with plants co-participation have been causing the formation of numerous barchan-like dune generations for approximately 3000 years on the sea barrier sands, further transformed to arc dunes as well as numerous relic mountains and deflation forms. On the terrain of the Park, there occur the dunes deriving from different periods, differentiating in look and genesis. 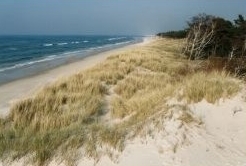 Contemporarily, moving dunes are the youngest forms on the Łebska Spit. The fact they were older is justified by the fragments of old dunes covered by soil, uncovered in between-the-dunes depressions. Archaeological findings from these soils allowed determining the beginning of modern dune-creation phase for the I half of the XVI century. Human being activity was the reason for damaging the vegetal cover and setting off the sands. This is justified by the wood coals from the forest fire in the soil level. The pace of dunes translocation is not uniform on the entire Łebska Spit. 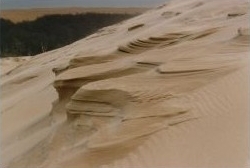 Its western and eastern part is occupied by the groups of parabolic dunes, characterised by mere mobility up to 3m/year. Most of them have been forested. The middle part of the spit (between the Łebsko Lake and the sea, at the length of approx. 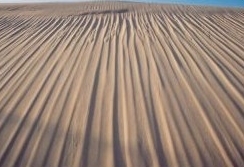 5 km and the width of 1 km) is occupied by the barchans and barchan-like dunes moving with the speed of 2 - 10 m/year, this is the area of contemporarily moving dunes. Western and north-western winds dominate in this area causing sand transportation and moving the dunes towards eastern and south-eastern direction; its result is entering the Łebsko Lake by some of the dunes. The sand movement starts with the wind blowing with the speed of 5m/s. The sand is being rolled on the smoother windward slope and when it reaches the dune's top, it pours down the steep leeward slope. In this hard-working way, the wind translocates the whole material included in the dune, from the west to the east, therefore accordant with the direction of the dominating winds. Very short-time storm winds at the speeds of above 10 m/sec have larger significance for the dune movement and the alteration of their formation than long-time winds of lower speeds. The highest intensity of eolian processes is observed in the autumn-winter period. The research has proved, it is caused not only by the strength of the wind and the humidity of the sub-stratum but also by the air temperature. Low temperatures increase the intensity of the processes.